Check out this new short from BarfQuestion Films featuring the Sulek song "Better or Worse"
2012 has been good to Sulek. We released an album, which was funded by you, our beloved fans, through Kickstarter. Thanks again for that. And that album has recieved favorable accolades from Sulek's hometown of Milwaukee, WI. Local Milwaukee paper The Shepherd Express declared Unbound At Last as one of the essential Milwaukee albums of 2012. Check out the article here. And Radio Milwaukee declared Sulek one of the top five Milwaukee bands of the year. Check out that list here. Thanks again for all your support. Please come see us at a show! And rest assured that work on album #5 has already begun and is sure to be our finest installment yet. We always say that. 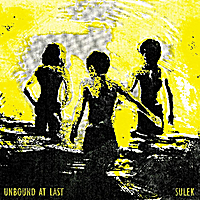 Sulek's new album, "Unbound At Last," was released on July 20th, 2012. You can purchase it at CdBaby, iTunes, or wherever you like to purchase music online. Read about the new album in The Onion and The Shepherd Express. Hear Sulek play a couple new songs on 88.9 Radio Milwaukee. Enjoy! Head over to CdBaby or iTunes to catch "Devil's Grin," the first single from Sulek's upcoming album release, "Unbound At Last." Here is your chance to secure your copy of Sulek's new album, Unbound At Last. Head on over to Sulek's Kickstarter Page and check out all the fun rewards we are offering, hear the first single from the album, and watch a video of Sulek's last day in the studio. Enjoy! SULEK AND BARFQUESTION TOGETHER AGAIN! Check out the latest video from BarfQuestion Films, Valentine's Day 2012, which features three Sulek songs: The Worms Conspire, The Runaway, and Fall Apart. The Worms Conspire is from our first album, Songs From The Doctor's Office, while the other two songs, The Runaway and Fall Apart, are from our upcoming album release, Unbound At Last, due out on July 20th. Visit www.barfquestion.com to see more! The long wait is over. Sulek's fourth studio album, Unbound at Last, will be released via iTunes, CdBaby, and wherever else you like to find music on July 20th, 2012. They will be playing an album release show in Milwaukee at Linneman's Riverwest Inn on that day as well. You will all be happy to hear that we have been very busy this month in the studio. The album is coming along very nicely. And to give you a little glimpse into our studio life, here is a little video we put together of clips from the studio. Keep in mind, we are musicians, not film directors. We had a bunch of cool photos too, but Patrick's computer crashed, so we lost them, sorry. Recording for Sulek's fourth studio album has begun! They are very excited about the new content and confident that it will be their best. Check out photos of the recording session in the "Photos" section of this website. HAPPY ANNIVERSARY SULEK! FREE DOWNLOADS, NEW LIVE SHOW DATES, AND AN UPCOMING ALBUM RELEASE! Today (or somewhere in the near vicinity of today) is the sixth anniversary of what we have come to call Sulek. Six years ago we got together for the first time to play some of our favorite radio tunes on instruments that we didn't know how to play, and to start writing a few of our own. To celebrate, we have a gift for you. Click the "listen" tab to the right to download our new single "White Bird." This will only be active for the next week, so don't wait, do it now! Also, if you check out our live show schedule, you will find that we have two upcoming dates, one of them being the first full band show since what was thought to be our last in July, 2010. And remember, stay tuned because our new album, "Birds in the Attic," is getting closer to you everyday. Here's a sneak peak at the album art (we promise, this isn't the cover). Free download of "Get It Out" for one week only! Sulek has officially finished recording, mixing, and mastering their third studio album "Birds In The Attic," and while they wait for finishing touches on the beautiful packaging of this album, they thought it would be nice to give you a peak at what it sounds like. Between 11/15/2010 and 11/22/2010 you can download thier new song "Get It Out" on their website SulekMusic.com. And if you found out about this too late, no need to worry, you can still listen to it for free on thier website, or the album might already be released, go look! New Sulek Album on the Way! Sulek is off the road and in the studio again! This time they are doing things a little differently. Instead of recording the album themselves (like they did for their past two albums) this time they have a producer. His name is Justin Heron and I can safely say now that five songs are already done, he is doing a great job. Sulek hopes to release the album by Christmas, but that is not a promise. Sign up on the email list and we'll let you know when the album is to be released. P.S.- Pending album name: "There's No Bottom"
Patrick, Ruthie, David, and Russ all graduated college this Spring and are ready to take Sulek on the road. Chris is still in medical school, but that won't stop him! Check Sulek's tour dates and come see them play live this summer! And don't forget, if Sulek is coming to your town, help spread the word by downloading their poster from the links page of this site, printing it off, and posting it all over the place.